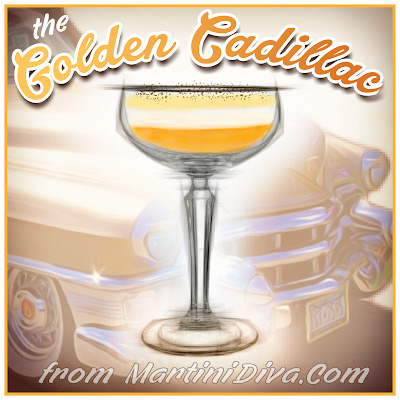 A friend of mine came over for cocktails the other day and when I asked him what he would like to drink and he immediately said, "A Golden Cadillac!" What a trip down memory lane! I hadn't had one in ages but I do remember them fondly, mostly from my days of what I considered sophisticated drinking in the seventies. Whenever I wanted to seem elegant and ladylike I'd order a Golden Cadillac. I grabbed the Galliano and my friend and I enjoyed several while we talked about trolling in our good old days. I forget about this cocktail and it usually takes a memory trigger or someone else to remind me of my fondness for it and then I'll blend one or two up for a little happy hour nostalgia. I never make this with ice cream as some do, I stick with the classic and enjoy the heck out of it. It's too heavy and sugar driven and just not the same with ice cream. 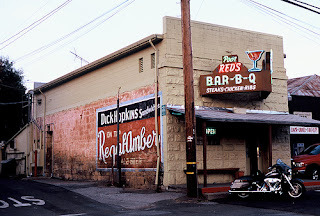 Created by bartender Frank Klein in 1952 at Poor Red's BBQ in El Dorado, California for a newly engaged couple who had driven up to Red's in a brand new Gold Cadillac, the Golden Cadillac is their signature drink and still served up to this very day. It's a creamy, frothy concoction of equal parts Galliano, White Crème de Cacao and Cream blended with ice and traditionally served up in a Coupe glass and garnished with chocolate shavings. And I don't care what anyone says, it's damn delicious. If you happen to be near El Dorado, take a side trip to Red's where they blend these up every day just like it was still 1952. You can also take a few Instagram worthy pics of the Golden Cadillac gifted to Red's by Galliano. DIRECTIONS Blend ingredients with ice until smooth, strain into a chilled Coupe and garnish with chocolate shavings.